A blog for the Commercial Overprint Society of Great Britain (COSGB). The business was founded in 1871 in Rochdale, Lancashire as Turner Brothers by John, Robert and Samuel Turner to manufacture cotton cloth based packaging. 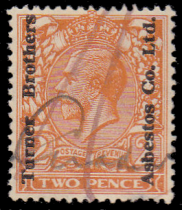 In 1879 the firm became the first in the UK to weave asbestos cloth with power-driven machinery, and the company name was changed to Turner Brothers Asbestos Co. The factory in Rochdale would grow to become the biggest asbestos plant in the world. Shortly before the First World War, the company opened an asbestos cement plant at Trafford Park, Manchester. One of its major products was Trafford Tile asbestos cement sheets, which were widely used for roof and wall construction in industrial and agricultural buildings. In 1920 Turner Brothers Asbestos Co. merged with the Washington Chemical Co., Newalls Insulation Co. and J. W. Roberts to become Turner & Newall. In 1929 Turner & Newall set up a distribution and sales arm called Turners Asbestos Cement Co. Ltd. The company grew rapidly in the 1930s and 1940s and operated an asbestos mine at Havelock in Swaziland from 1939 until 2001. In 1998 the business was acquired by Federal-Mogul, a US based automotive supplier. Federal-Mogul was overwhelmed by asbestos related lawsuits against its new subsidiary and put Turner & Newall into bankruptcy protection in 2001. The company emerged from bankruptcy protection in 2007 with a trust created by Federal-Mogul to pay for future asbestos liabilities. 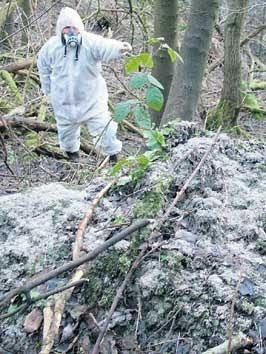 Today the site of the heavily-contaminated Rochdale site is derelict although new owners plan to build 600 homes there. J. C. & J. Field Ltd.